“Four From Aferro: Art Talk,” Maplewood Patch News, January 27th, 2014. Teachers College Columbia University, “Doing and Undergoing,” Exhibition Catalogue 2013. Arthur Bruso and Raymond E. Mingst. “A Time in Arcadia,” Curious Matter, May, 2013. Summer Dawn Hortillosa. “Curious Matter and the Jersey City Library Team Up for ‘A Time In Arcadia’ Art Exhibit,’ JCIndependent Newspaper. June, 2013. Gallery Aferro, “Art, Auction, Party, Fifth Annual Benefit,” Exhibition Catalogue 2013. The Walsh Gallery at Seton Hall University, “Cell Mates,” Exhibition Catalogue 2013. Curious Matter, “A Time In Arcadia,” Exhibition Catalogue, 2013. Publisher, Steven Zevitas; The Open Studio Press. “A Juried Selection of International Visual Artists.” Jurer Dina Deitsch, Senior Curator; deCordova Museum and Sculpture Park in Lincoln, MA. Winter Edition Studio Visit Magazine. Volume 21, 2013. “Through You Into Action,” Exhibition Catalogue. Gallery Aferro Publication No. 19, June 2012. Catalogue design by Kevin L. Hau. “Gallery Aferro Studio Residency 2011,” Residency Catalogue. Gallery Aferro Publication. June 2011. Dan Bischoff. “Exhibition of contemporary works looks to the past and future, at once,” Star Ledger, June, 2010. Dan Bischoff. 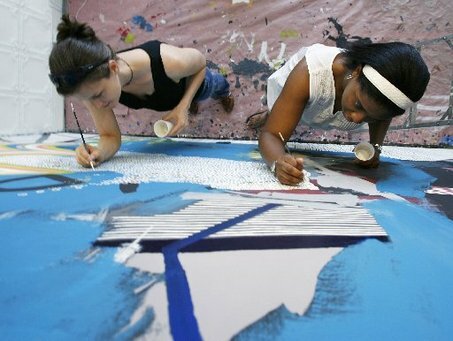 “High school artists team with mentors to prepare for ArtReach show,” Star Ledger, June, 2008. “Once more this year, Jersey City artist Vikki Michalios has collaborated with a student — Alisha Mondesir from Arts High — on a mural that sort of eats itself, with one artist working over the contributions of the other. Their interaction is recorded on digital video, with the video being the actual artwork in the show at CWOW. Only this year, instead of working in charcoal on paper, they painted on the wall with latex house paint. Larry Walczak. “Walking Williamsburg,” NY ARTS Magazine Vol. 13 No. 11/12, 2008. Dan Bischoff. “Aspiring artists work side by side with the pros,” Star Ledger, June, 2007. “Take, for example, the wall-sized charcoal mural by Tiara Montgomery of Weequahic High and Vikki Michalios, who keeps a studio in Jersey City. The pair also made a video montage of themselves working on several large-scale murals, all in charcoal, edited with the help of Kenneth Trotta of IVH Entertainment, who digitally remastered the video so the murals proceed with a time-lapsed, syncopated rhythm set to a hip-hop track. “I had never done installation art or large-scale drawing before at all,” Michalios says. “It was Tiara who came to the studio every Saturday and Sunday, often staying six hours or more, very quiet and reserved at first but full of these ideas. She had worked on another art project where they made an art video, so I thought we could make one of our progress. Working at mural scale made that easy … I’ve always painted geometric shapes, but Tiara was more comfortable with imagery, and she brought in Egyptian symbols as a starting point. L. Craig Schoonmker. “Two Art Receptions Thursday” Newark, USA, June 13th, 2007.